Pluto’s largest moon Charon is home to an unusual canyon system that’s far longer and deeper than the Grand Canyon on the Earth, a new image taken by Nasa’s New Horizon probe has revealed. The deep canyon named Argo Chasma is approximately 700 km long while Arizona’s Grand Canyon is 450 km long. New Horizons scientists estimate Argo Chasma to be as deep as 9 km, which is more than five times the depth of the Grand Canyon. There appear to be locations along the canyon’s length where sheer cliffs reaching several miles high occur and which could potentially rival Verona Rupes on Uranus’ moon Miranda (which is at least 5 km high) for the title of tallest known cliff face in the solar system. The image was obtained by New Horizons’ Long Range Reconnaissance Imager (LORRI) at a resolution of approximately 2.33 km per pixel. It was taken at a range of approximately 466,000 km from Charon, 9 hours and 22 minutes before New Horizons’ closest approach to Charon on July 14 last year. Pluto’s largest moon, Charon, once had a sub-surface ocean that has long since frozen and expanded – pushing outward and causing the moon’s surface to stretch and fracture on a massive scale, recent images from Nasa’s New Horizons mission had revealed. Charon is characterised by a system of “pull apart” tectonic faults, which are expressed as ridges, scarps and valleys – the latter sometimes reaching more than 6 km deep. Charon’s tectonic landscape shows that somehow, the moon expanded in its past and Charon’s surface fractured as it stretched. “The outer layer of Charon is primarily water ice. This layer was kept warm when Charon was young by heat provided by the decay of radioactive elements, as well as Charon’s own internal heat of formation,” the US space agency had said in a statement. Scientists said Charon could have been warm enough to cause the water ice to melt deep down, creating a subsurface ocean. But as Charon cooled over time, this ocean would have frozen and expanded – lifting the outermost layers of the moon and producing the massive chasms we see today. 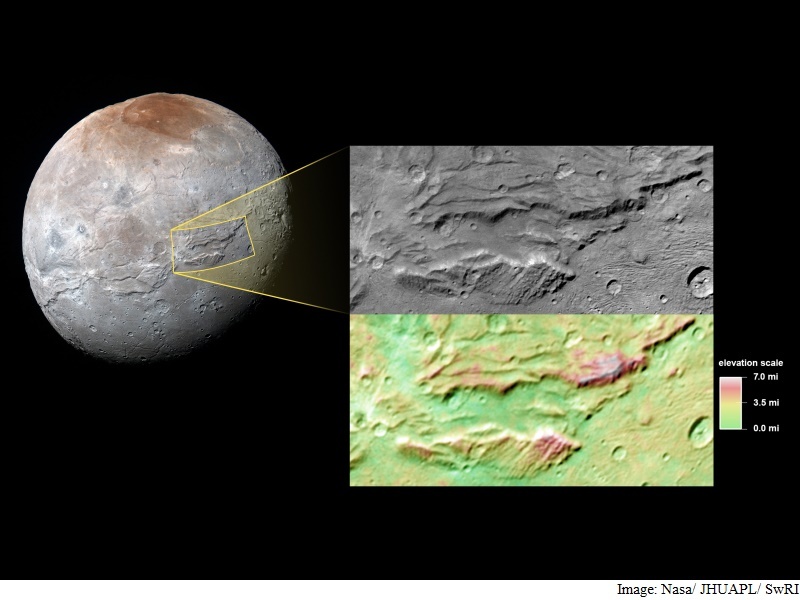 No Comments on "Super Grand Canyon Spotted on Pluto’s Moon Charon"